Blues is a Woman — Laguna Beach Live! 6 Bodacious Women tear up the stage in a celebration of song and famous Women! For two years following her successful national touring show, Wild Women of Song: Great Gal Composers of the Jazz Era, Bay Area singer-songwriter Pamela Rose has worked closely with five exceptional blues musicians to develop a new multimedia project that tells the remarkable story of women and the blues. Creative Direction by Jayne Wenger. Rose's BLUES IS A WOMAN blurs the boundaries between concert and theater, using storytelling, rare film footage, and music to bring to life the colorful history of the bold and singular women who wrote and popularized the blues.Some of the names are well known – Nina Simone, Aretha Franklin, Janis Joplin – and others should be – Ma Rainey, Ida Cox, Memphis Minnie, and so many more. 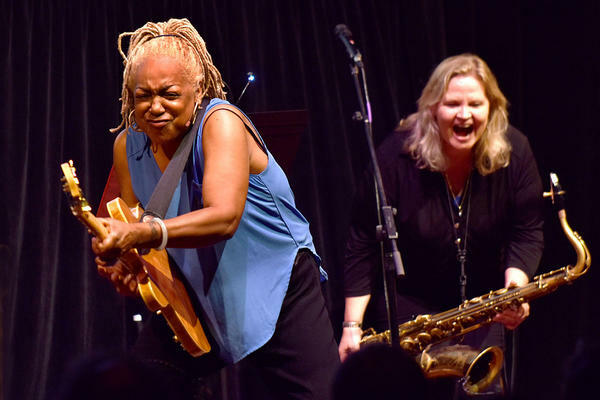 The voices of these women are vibrant, challenging, inspirational, and dynamic, and BLUES IS A WOMAN seeks to ensure that these women, their histories, and their message will be remembered and celebrated.